Analysis: His absence shouldn't be a surprise, Yates points out, as Bennett takes residence in Hawaii in the offseason. Bennett was traded from the Eagles on March 14, after recording 34 tackles (25 solo) and nine sacks last season. The 33-year-old presumably will join the team at some point in the offseason and is projected to seal a starting spot on the Patriots' defensive line. Analysis: Bennett was alleged to have injured a 66-year-old paraplegic while pushing his way onto the field after his brother, Martellus Bennett, won Super Bowl LI with the Patriots. With those charges dismissed, Bennett can now fully focus on integrating himself within that same New England squad in advance of the 2019 campaign. Analysis: Traded from Philadelphia to New England in mid-March, the 33-year-old defensive end now receives a contract more to his liking, highlighted by a $4 million signing bonus. Bennett is working on seven straight years with at least five sacks, producing 57 in 107 games during that stretch. He should be headed for heavy snap counts as New England's replacement for Trey Flowers (Lions). The Eagles are working on a trade to send Bennett to the Patriots, Jeff McLane of The Philadelphia Inquirer reports. Analysis: The Eagles were reportedly shopping Bennett at the NFL Combine and he responded by saying "We are in a tough situation as far as the salary cap, I'm not willing to take a pay cut. I actually want a pay raise at this point." Even if the team is unable to find a suitor, it doesn't necessarily have to keep the veteran defensive end, as he would carry zero dead cap if released. Bennett tallied 34 tackles, nine sacks, one pass breakup and two forced fumbles over 16 games in 2018. Bennett (foot) is active for Sunday's playoff game at New Orleans. Analysis: Bennett has been battling the foot issue since late November but he has yet to miss a game this season. The veteran defensive end should take up his usual starting workload on the Eagles' defensive line. Bennett (foot) is officially listed as questionable for Sunday's divisional-round playoff game against the Saints. Analysis: Bennett didn't practice Wednesday or Thursday but worked as a limited participant Friday. If the veteran defensive end is able to suit up through his lingering knee injury, he'll play a significant role in Philadelphia's defensive line rotation in New Orleans. Bennett (foot) is active for Sunday's wild-card game at Chicago. Analysis: Bennett was once again questionable with the foot issue but will continue to battle through the injury. The veteran defensive end will play a significant role in the Eagles' defensive line rotation against the run-heavy Bears. Bennett (foot) is officially listed as questionable for Sunday's wild-card game against the Bears. Analysis: Bennett did not practice Wednesday and Thursday, but he was a full participant Friday. The veteran defensive end appears on track to play through his lingering foot injury, as per usual. If he's able to suit up, Bennett will be a valuable asset in Philadelphia's defensive front. Bennett (foot) is active Sunday against Washington. Analysis: While Bennett could match his career-high sack total if he's able to get to opposing QB Josh Johnson twice, he's not the safest of IDP options after accumulating just one combined tackle in 113 snaps over the last two weeks. Bennett (foot) is questionable for Sunday's game against Washington. Analysis: Bennett was a limited participant in Friday's practice after having been held out Wednesday and Thursday. The veteran defensive end managed to play through his foot injury during last week's win over the Texans and will attempt to do so again Week 17. Bennett (foot) is active for Sunday's game against the Texans, Dave Zangaro of NBC Sports Philadelphia reports. Analysis: Bennett managed only one limited practice this week, but that activity will be enough for him to gain clearance for gameday. 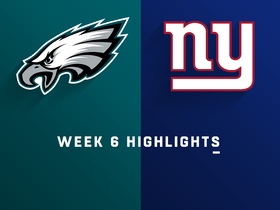 Since Derek Barnett (shoulder) suffered a season-ending injury in Week 7, Bennett has taken a heightened role in the Eagles' end rotation and has made the most of it, notching five sacks over the last seven contests. Bennett (foot) is questionable for Sunday's game against the Texans, Dave Zangaro of NBC Sports Philadelphia reports. Analysis: Bennett continues to nurse a foot issue sustained Week 12 versus the Giants. The veteran defensive end has not yet missed a game this season and appears on track to play through his injury again Week 16. Bennett is active for Sunday night's game against the Rams, Reuben Frank of NBC Sports Philadelphia reports. Analysis: Bennett has been playing through a foot injury since Week 12 and will do so once again. Given the Eagles' depleted secondary, they need all the help they can get on the defensive side of the ball. Bennett (foot) is questionable for Sunday's game versus the Rams, Zach Berman of The Philadelphia Inquirer reports. Analysis: Bennett didn't practice Wednesday or Thursday but worked at full speed Friday. The 33-year-old continues to excel as a pass rusher with eight sacks in 13 games, and he needs two more to tie his career high of 10 set back in 2015. Bennett's final status will be revealed with the release of inactives 90 minutes before the game's 8:20 PM ET kickoff. Bennett recorded seven tackles (five solo), 1.5 sacks and one forced fumble during Sunday's 29-23 loss to the Eagles. Analysis: Bennett was a disruptive force during Sunday's divisional loss, and now has eight sacks on the season. The veteran defensive end is a sack-dependent IDP option, and faces a tough matchup against the Rams in Week 15. Bennett is active for Sunday's game against the Cowboys, Tim McManus of ESPN.com reports. Analysis: Bennett's presence will be a boon to the Eagles' pass rush. The team needs all hands on deck given that they're down several starters in the secondary. Bennett (foot) is listed as questionable for Sunday's contest against the Cowboys. Analysis: Bennett started the week with a limited practice Wednesday. The former Seahawk wasn't able to participate at all Thursday, but he was able to log a full session Friday. Regardless, Bennett is expected to play Sunday, according to Jeff McLane of The Philadelphia Inquirer. If he were to experience a setback, Josh Sweat could see an increase in reps.
Bennett (foot) is expected to be available for Sunday's game at Dallas, Jeff McLane of The Philadelphia Inquirer reports. Analysis: Bennett didn't practice Thursday, but he should retake the practice field Friday, according to Mike Kaye of NJ.com. The 33-year-old's limited practice reps this week could see him receive the questionable tag once again, but he still appears on track to play in Sunday's divisional matchup. Bennett (foot) did not practice Thursday, Calvin Watkins of The Athletic reports. Analysis: Bennett was able to practice in a limited fashion Wednesday but was downgraded Thursday. The veteran defensive end's status for Sunday's divisional tilt against the Cowboys is murky at best. Bennett has not yet missed a game this season, but if he were to be sidelined Week 14, expect Chris Long to start at right defensive end. Bennett (foot) is active for Monday's game against the Redskins, Eliot Shorr-Parks of Sports Radio 94 WIP Philadelphia reports. Analysis: Bennett will suit up for Monday's divisional tilt against Washington despite having suffered a foot injury during a Week 12 win over the Giants. The veteran defensive end has 6.5 sacks on the season, and he'll look to build upon that number against Colt McCoy and the Redskins. Bennett (foot) is listed as questionable for Monday's game against the Redskins. Analysis: It seems likely Bennett will take the field Monday despite sustaining a foot injury last week against the Giants, which kept him off the practice field Thursday and Friday. The veteran defensive end has 6.5 sacks through 11 games this season. Coach Doug Pederson expressed his optimism for Bennett's (foot) availability for Monday's game against the Redskins, Zack Rosenblatt of NJ.com reports. Analysis: Bennett is nursing a foot injury that he sustained in Week 12 against the Giants. The former Seahawk has yet to practice this week as he missed both Thursday's and Friday's practices. Bennett's practice status Saturday should reveal whether coach Pederson's comments have any truth to them. Bennett (foot) did not practice Thursday. Analysis: Bennett is nursing a foot injury suffered during a Week 12 win over the Giants. The 33-year-old defensive end believes that he'll be able to suit up against the Redskins on Monday, according to Les Bowen of the Philadelphia Daily News, but his participation in practice as the week continues still warrants monitoring. Bennett had a sack in Sunday's 25-22 win against the Giants. Analysis: Bennett did exit the game after sustaining a foot injury, but was able to return and still played 57 percent of defensive snaps. The 33-year-old has 21 total tackles, 6.5 sacks and a forced fumble through 11 games. 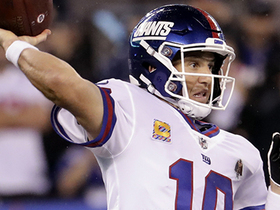 Bennett (foot) has returned to the field during the first half of Sunday's game against the Giants, Jeff McLane of Philly.com reports. 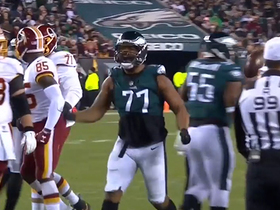 Analysis: Bennett was able to return in a timely fashion despite heading for the locker room earlier in the game, though another setback would call for Chris Long and Fletcher Cox to see additional work. Bennett is questionable to return to Sunday's tilt against the Giants with a foot injury. Analysis: Bennett limped to the locker room during the first half of Sunday's contest and will undergo further evaluation before a decision is made on his availability. In the meantime, Chris Long and Josh Sweat could see additional reps at defensive end across from Brandon Graham. Bennett had two sacks in Sunday's 27-20 loss at Philadelphia. Analysis: Bennett replaced Derek Barnett (shoulder) as the starter at right defensive end in late October and has a sack in four straight games and five of the last six. The multisack performance is the 33-year-old's first since Week 8 of last season, and he now has 5.5 sacks in 2018. Bennett will replace Derek Barnett (shoulder) at right defensive end, Tommy Lawlor of the Eagles' official site reports. Analysis: Bennett should draw the start and see more snaps Sunday in London, although Chris Long and Josh Sweat will likely see increased work as well. The 32-year-old could be a sneaky good IDP play as he'll be matched up against a backup tackle and therefore should have ample opportunity to make plays. The Texas A&M product has 15 tackles (10 solo) and three sacks on the season. Bennett is expected to take on a bigger role following Derek Barnett's shoulder surgery, Tim McManus of ESPN.com reports. Analysis: Despite the sour news stemming out of Philadelphia on Tuesday, there's reason for optimism with Bennett assuming a larger role. The 10-year vet has showen he still has gas left in the tank as evident by his three sacks over the team's last four contests. Bennett has earned time interchangeably throughout the early going, so a dropoff of large proportions is not expected to occur. 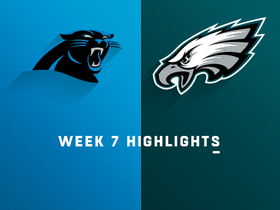 Bennett recorded two tackles (one solo), including a sack, in Sunday's loss to Carolina. Analysis: Bennett started the season off slow but has now recorded three sacks in the last four weeks. He hasn't put up big tackle numbers, but he'll be a decent fantasy option if he can continue getting to the quarterback each week. He and the Eagles will take on the Jaguars and their struggling offense in Week 8. Bennett had six tackles (four solo) with a sack and a forced fumble in Thursday's win over the Giants. Analysis: The sack is Bennett's second of the season and Thursday marked the first time this year he posted more than two tackles. The 32-year-old played 47 of 65 defensive snaps -- tied with Chris Long for the most among defensive linemen -- and was much more involved than previous weeks. Bennett recorded one tackle and one sack across 36 defensive snaps in Sunday's loss to the Titans. 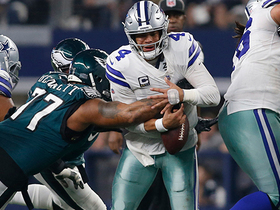 Analysis: Bennett has been a rotational piece on the defensive line since joining the Eagles this season, playing in 51 percent of the defensive snaps Sunday. He logged his first sack of the season and now has six tackles on the year. Bennett (knee) is not listed on Wednesday's injury report, Mike Jones of USA Today reports. Analysis: Bennett was added to the injury report Tuesday with a knee issue, but he doesn't appear to be in any danger of missing the opener against Atlanta. The veteran defensive end figures to rotate in for the Eagles this season after totaling 8.5 sacks and 40 tackles (25 solo) last season. Bennett (knee) was added to the injury report Tuesday, Eliot Shorr-Parks of 94WIP.com reports. Analysis: Bennett has historically rested the final practice of the week, and it seems like that trend will continue in Philadelphia. Barring any major setbacks, expect Bennett to be on the field Thursday night. 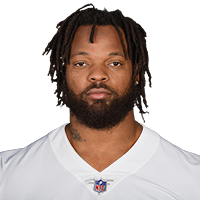 Bennett will be arraigned Aug. 7 on his March indictment for felony injury to the elderly, Tom Pelissero of NFL.com reports. Analysis: The incident in question is when Bennett entered the field after his brother, Martellus, won the Super Bowl in February of 2017. Pelissero adds that the courts are seeking a tape that shows Bennett as he arrives at the field. The August date for arraignment is problematic since it's just two days before the Eagles' first preseason contest. If the case goes to trial, it'll likely be after the season. Bennett reported for the Eagles' mandatory minicamp Monday, Dave Zangaro of NBC Sports Philadelphia reports. Analysis: The Eagles don't take the field until Tuesday, but Bennett's presence at the facility is significant nonetheless since the defensive end didn't attend voluntary OTAs this spring. While it's possible his legal situation could prevent him from taking the field in Week 1, Bennett presumably will still be entering camp with the first-string defense. Bennett didn't report to first day of OTAs on Tuesday, Dave Zangaro of NBC Sports Philadelphia reports. Analysis: This isn't related to the felony charge Bennett is facing in Harris County, Texas, Tim McManus reports, and head coach Doug Pederson isn't worried about his absence. Bennett has racked up 23.5 sacks during his last three seasons with the Seahawks, and he will help bolster an already strong defensive corps in Philly. A Harris County, TX grand jury indicted Bennett on Friday for a felony charge of injury to the elderly, Jerome Solomon of The Houston Chronicle reports. Analysis: Bennett allegedly hurt a 66-year-old paraplegic while pushing his way onto the field at the conclusion of Super Bowl LI when the Patriots defeated the Falcons. His new team, the Eagles, released a statement acknowledging they're aware of the situation and are in the process of gathering information, but they don't have any further comment at the time. Bennett was traded from the Seahawks to the Eagles at the start of the league year in mid-March. The Seahawks have agreed to trade Bennett and a seventh-round pick to the Eagles for wide receiver Marcus Johnson and a fifth-round pick, Adam Schefter of ESPN reports. Analysis: Seattle's fearsome defense of recent seasons is embarking on a sea change in its ranks. Bennett will be the first to depart -- once the new league year starts March 14 -- joining the reigning Super Bowl champs. Owed $18 million over the next three seasons, he'll join a D-line rotation that includes Fletcher Cox, Vinny Curry, Brandon Graham, Timmy Jernigan, Chris Long and Derek Barnett. During his five seasons with the Seahawks, Bennett compiled at least seven sacks on four occasions. Bennett said Sunday that he, "probably won't be [with Seattle] next year" following the Seahawks' 26-24 loss to the Cardinals in the season finale, Gregg Bell of The Tacoma News Tribune reports. Bennett had four tackles (three solo) and a sack in Sunday's 21-12 victory over the Cowboys. Analysis: The sack brings Bennett's season total to 8.5, and is his first one since Week 12 against the 49ers. The veteran defensive end has had a quiet second half of the season, registering only 18 tackles (11 solo) and two sacks in eight games. Bennett (knee) won't carry an injury designation into Sunday's game against the Cowboys, Gregg Bell of The Tacoma News Tribune reports. Analysis: Bennett was a full practice participant Friday after sitting out earlier in the week. The Seahawks were likely expressing caution with their veteran defensive end, who looks to be ready to play Week 16. Bennett (knee) won't practice Wednesday but is still expected to play Sunday against the Cowboys, Michael-Shawn Dugar of SeattlePI.com reports. Analysis: Bennett is experiencing swelling in his knee, and his practice reps are simply being scaled back to keep him fresh for Sunday's game. Bennett was a full participant at Friday's practice after failing to participant earlier in the week due to a knee injury, John Boyle of Seahawks.com reports. Analysis: Bennett was likely held out of practice on Wednesday and Thursday as a precaution with what appears to have been a minor knee issue, but he'll be good to go in Week 14 against the Jaguars. He's notched just one sack in the Seahawks' past four games, so he'll look to get back on track in Jacksonville. Bennett had four tackles (three solo) and a sack Sunday against the 49ers. Analysis: Bennett has now climbed to 7.5 sacks this season, but he averages less than three tackles per game. With a Sunday night matchup against Philly on the horizon, Bennett will have his work cut out for him versus QB Carson Wentz, who has been sacked just twice in his last three games. Bennett had one assisted tackle and a sack in Sunday's loss the Redskins. Analysis: Bennett increased his season sack total to 6.5, but was otherwise quiet against a patchwork Redskins' offensive line. The 31-year-old played 58 of 63 defensive snaps and didn't appear to aggravate his lingering foot injury, although he will likely see limited practice reps again this week. 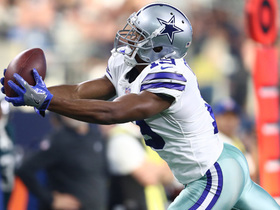 Dallas Cowboys wide receiver Amari Cooper extends for a 27-yard fingertip grab. 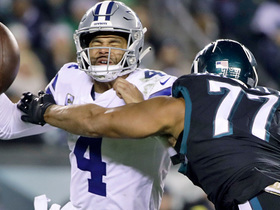 Philadelphia Eagles defensive end Michael Bennett sacks Dallas Cowboys quarterback Dak Prescott for a loss of nine yards. 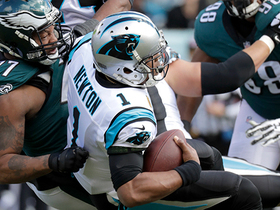 Philadelphia Eagles defensive end Michael Bennett shreds blockers to pick up a sack on Carolina Panthers quarterback Cam Newton. 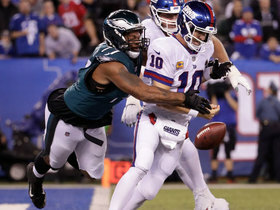 Philadelphia Eagles defensive end Michael Bennett nearly causes a safety after strip sacking New York Giants quarterback Eli Manning.